Hi All, I want to tell you about the cat litter we got to try and LOVE! 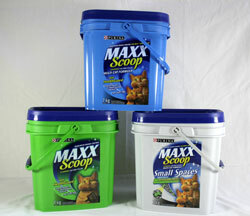 It's Purina Maxx Scoop. I love the small spaces clumping litter. It smells great and is low dusting (big bonus when you fill the litter box up) Our Cats seem to like it also. We have 3 cats (2 males) and we usually clean the box once or twice a day. There are no more peeing or poops beside the box either! I got to try out this awesome litter by going to Try Maxx Scoop and you take a little survey, they send out a coupon for you to try it and then tell people how you like it. They contact you a few weeks later for a survey on how you enjoyed your new litter.